Welcome! Please come visit us. Park right in front of our door…come in… relax…take a deep breath…smell the wonderful aromas…have a cup of tea… listen to the uplifting music…enjoy shopping the way it was meant to be…FUN! CONNECT with us and other like-minded kindred spirits. 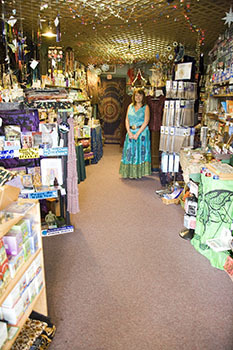 IMMERSE yourself in the healing power of the Earth through your love of nature, crystals, essential oils and fairies. EXPLORE the higher realms through the divine, angels, gods, goddesses, psychic development, and auras. DEEPEN your spiritual life through books, meditation, prayer and exploration of the wisdom found in all spiritual paths. UPLIFT your mood with essential oils, crystals, incense, music and just plain beautiful creations of art, jewelry and clothing. NURTURE your love of animals through investigating animal totems and pet communication. INDULGE in pure and natural body care products made with the finest ingredients such as shea butter, hemp seed oil, cocoa butter, argan oil, olive oil, and essential oils. PURIFY & PROTECT yourself and your space with sage and smudge, essential oils, crystals and candles. SET YOUR INTENTIONS through positive THOUGHTS and mindful ACTION to manifest your best year ever!